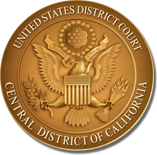 Due to the ongoing move of judges and personnel of the United States District Court for the Central District of California out of the United States Courthouse located at 312 N. Spring Street, Los Angeles, California, one of the two public entrances to that courthouse has been closed. Effective immediately, public access to the courthouse will no longer be available through the entrance located on the Main Street side of the building. Members of the public will now be able to enter the building only through the entrance located on the Spring Street side.